“You are a very tolerant person,” she said, apologetically. You’re faith is ridiculous, and so are you, I thought, baring my teeth silently in what I hope passes for a smile. Well, that may be a harsh assessment. True, it may seem absurd to disregard evolution as an elaborate scam, while believing Krishna (the blue-skinned, flute-playing deity and lord of all creation) danced on a hundred-headed snake monster by this tree here, it’s five-thousand years old! Really! And yet, from the inside, it works. Beautiful temples, chants, and texts – these things are real. These things are true. Who among us isn’t guilty of believing in some ridiculous thing or other? It’s what makes us human. Bah! Tolerance can be a drag, sometimes. I am certainly grateful to Alla for her help. This can’t be overstated. Something about Vrindavan did rub me the wrong way. Perhaps it was Alla’s motherings, ministrations, and preaching. After all, I had come here to escape these very things. Perhaps it was just the jet-lag. And perhaps it was the city itself. Well, not even a city, really. A small town. A small, filthy, starving town. 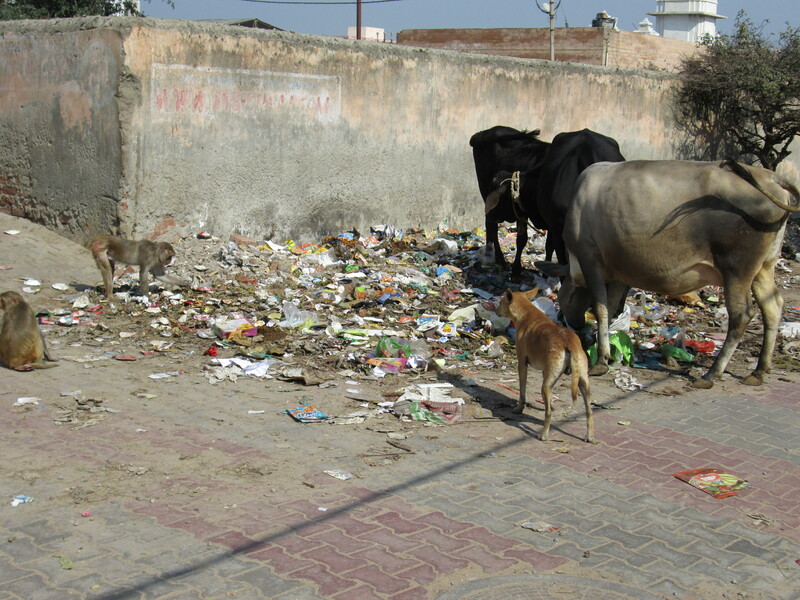 There was garbage and sewage everywhere. It stank. Whether man or beast, all creatures there seemed to have been reduced to scavenging. I am glad to be gone from there. Of course, there were sights to be seen. 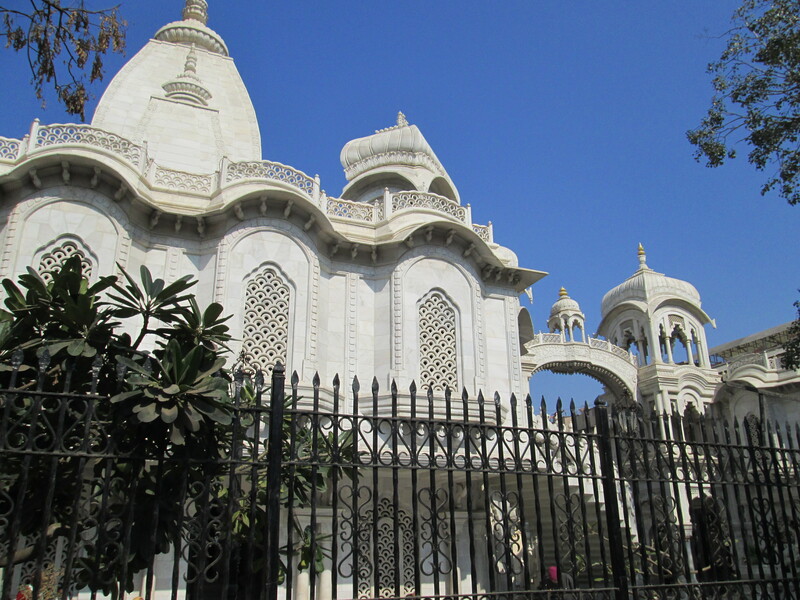 Temples galore, holy Goshala gardens, the sacred Yamuna river, wherein Krishna is said to have bathed. However, I was glad to discover, behind both these facades, in the back alleys and ways, Vrindavan’s true life. There, people go on about their business calmly and pleasantly. It still smells awful. To the full Vrindavan album. 1. The train arrived only seven and a half hours late. 2. I boarded at the station of origin, ergo on time. I quickly realized something: I’m a city boy. Always have been. Bustling Allahabad suits me much better than stagnant Vrindavan. Surprisingly, it’s actually cleaner here. But the main difference is the feeling that this place has a life of its own. It’s not waiting hungrily to feed off mine. I made a new friend today! His name is Martin, and he’s a Czech psychologist. We are now sharing a room. I have spared you the images of my previous Allahabad accommodations. Some things are better left unsaid, and unseen. And unsmelled. Too late for me on all counts. Sanjit, Anand and Amit, the Mumbian Yoga teachers. Ram and Vishal, the local computer engineering students. Arjun, the vendor at the kiosk next to the Allahabad central post. 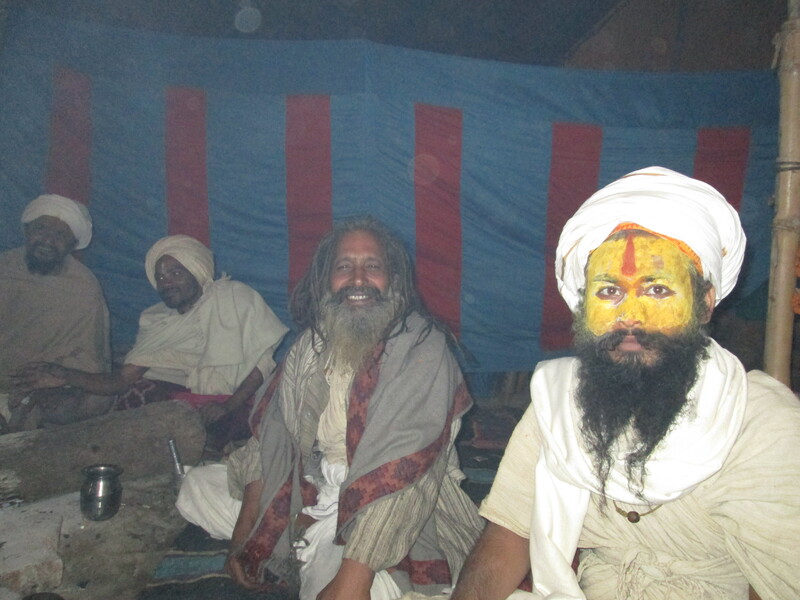 And many, many others, including a few nameless (as far as you’re concerned) Yogis at Kumbh Mela. Wait… What’s a Kumbh Mela??? 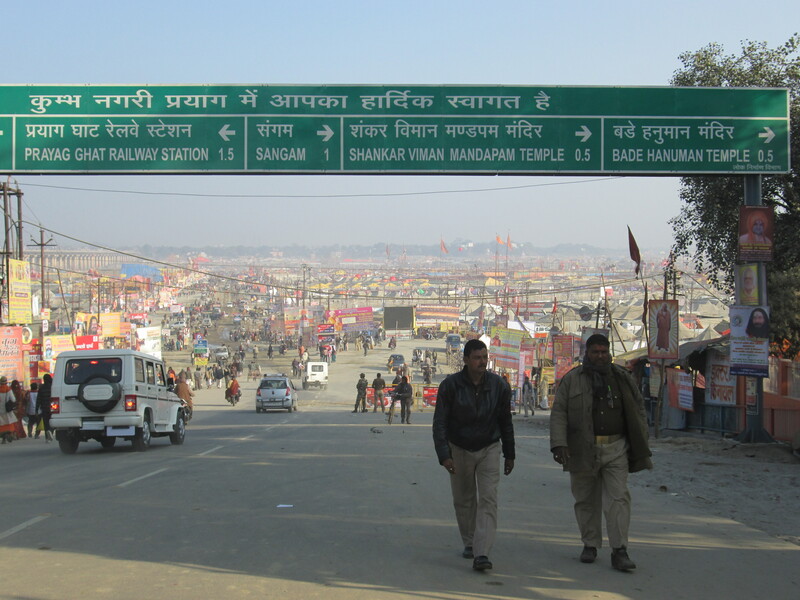 Kumbh Mela. It’s here, and so am I. Yesterday evening, I went to check it out.First impression? Tents. Tents, everywhere. As far as the eye can see. Quite overwhelming. I went to see the temple of Hanuman, then plunged, headfirst – into the river. The Sangam is the intersection point of three holy rivers: The Ganga, The Yamuna, and the Saraswati. People come there for their sacred bath, especially during Kumbh time. I’m sure it’s horrifyingly polluted, but no more so than my room. What the hell, right? On January 27th, there’s going to be a full-scale ceremonial Kumbh dipping. February 10th is going to feature an even bigger festival. Full Allahabad & Kumbh album. Good news, everyone! I have arrived, safe and sound, in the land of India. 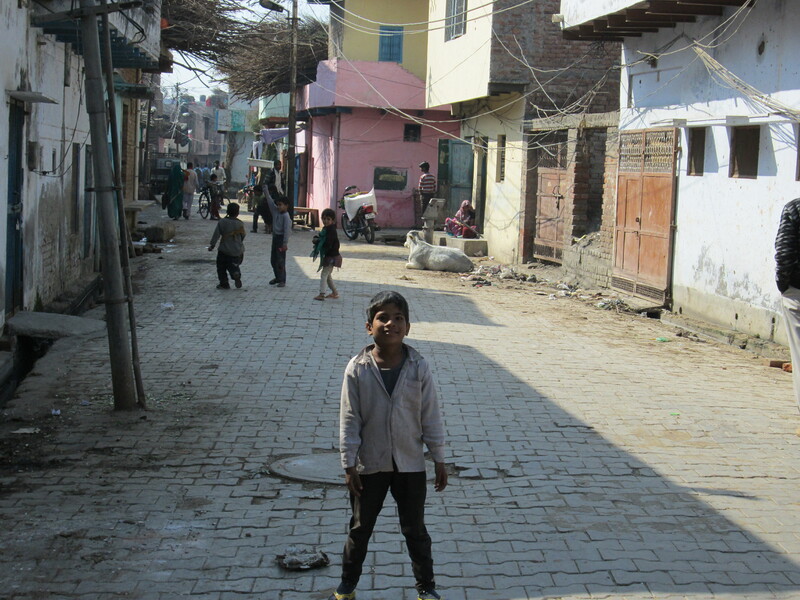 I am writing this update from the town of Vrindavan, birthplace of Krishna. “I’m Alla, by the way,” she said. The woman sitting beside me on the Airplane was a stoutly built Russian with her hair dyed red. We had spent most of the ride in silence, and were nearing our destination. “My name is Shai,” I replied. That’s how I ended up here. Alla is of the Hare Krishna spiritual movement, and after a brief theological debate she invited me to join her here for a spiritual tour. And when adventure comes a-knocking, I am always ready to get the door! Landing. Taxi. Bus. Auto-rickshaw. Vrindavan. “Take rest,” said Alla, in her Russian-accented, Indian-dialect-tinted English. I was all too happy to oblige, as she sat me down in the lobby of some shoddy, vacancy-less guest house, while she went to find me suitable accommodation. She has quite taken me under her wing by now. The moment she left me in my room, at some hotel whose name I can’t remember, much less pronounce, I collapsed, sleeping in a bed for the first time in over 30 hours. For nearly 30 hours, I have been living in airports. Tel-Aviv, Moscow, Delhi. They’re all the same. Wherever I go, Brad Pitt’s face follows me around, advertising some perfume or other. This is a very long fall. Leaving is like jumping from a cliff into a freezing cold pool. You don’t think about what comes next. You just jump. Except this jump is going to leave me suspended in the air for 30 hours. That’s a lot of time to think. Stepping through security, waving goodbye to my family, I know this is it. I have now truly left everything behind. This blog is going to chronicle my travels abroad, in India and beyond. הנה הבלוג. זה יהיה הפוסט האחרון שכתוב בעברית, מכורח הנסיבות.